Home » Was the “Wow! Signal” Alien? SETI stands for the search for extra-terrestrial intelligence, but there is no single SETI group. For a long time, many different organizations have engaged in their own searches, but there’s no central authoritative project. Virtually every radio telescope is used at least part time by some group scanning the skies looking for signals that might come from some interstellar source. The longest single search project was carried out by Ohio State University, from 1972 to 1997. When you hear about the Wow! signal, one of the most important and obvious questions to ask is where it came from, and what’s there. To understand where the signal came from, and (at least as importantly) how we know where it came from, it’s necessary to understand the workings of the interesting radio telescope that received it. In 1980, a feature was added to the Big Ear that could have come in very handy when the Wow! signal was detected; and that was a set of tracks upon which the receiving horns could move east or west across the face of the flat reflector. This allowed the telescope to fix its view on the sky at any given point when an interesting signal was detected, compensating for the movement of the Earth’s rotation, and allowing a single spot to be studied for a time. Crucially, this feature was not yet installed in 1977; so the telescope swept across the Wow! signal for the duration of its detection. It took 72 seconds for the Earth’s rotation to move any given point in the sky across the Big Ear’s reflectors, and that’s why the recorded portion of the Wow! signal was 72 seconds long. The Big Ear would alternate recording between the two receiving horns. Subtracting the signal from one horn from that of the other was a way to identify and reduce noise in the signal. This cleaned-up signal is what got recorded. The horns were physically right beside each other, so each was focused on a slightly different position in the sky — about two minutes apart, by the speed at which the sky rotates past. It’s known that the Wow! signal was audible to only one of the two horns, but there was no way to tell which one because of the way the signal was recorded. The Wow! source either started or stopped inside the time gap between the two horns, and lasted less than 24 hours, since it was not detected at that same declination either the day before or the day after. So it’s not known how long the actual signal lasted; somewhere between 72 seconds and 24 hours. When you look at a star map showing the location of Wow!’s origin, you see two little line segments, one from where each horn was recording at the time. These little dashes are in a part of the sky where there’s nothing of much interest. No close stars, no other radio sources, just… well, space. There’s nothing obvious there to listen for, but nevertheless, astronomers have on many, many occasions pointed telescopes at Wow!’s origin, hoping to hear it again; but nobody ever has ever heard even the slightest blip. Whatever Wow! was, it was transient. Try as we might, we’ve never been able to find it again, in over 100 different attempts. Another question to which we might want to know the answer is what was interesting about the Wow! signal. Obviously there are many different types of radio signals bouncing around space all the time, so how do we know that there was anything special or unusual about this one? The solution to this lies in the signal’s frequency. To understand why the Wow! frequency was noteworthy, we have to know a little about the cosmic radio environment. There are different kinds of noise in different parts of the radio spectrum. Throughout the radio spectrum, there is a background level of about 3 Kelvins representing the leftover noise from the Big Bang. So that 3 Kelvin level is the quietest window we might hope to find. Below about 1 GHz, there’s a lot of galactic noise, making it hard for an artificial signal to compete. And above about 10 GHz, something called quantum noise — in a nutshell, the uncertainty of photonic measurements — becomes too great to listen through. So we have a relatively quiet window between 1 and 10 GHz. Not only is there noise at different frequencies, but planetary atmospheres like Earth’s block out a lot of different chunks of the spectrum; absorbing some of it, and reflecting others. There are two great windows through which our atmosphere is more or less transparent to electromagnetic radiation. First is the visible spectrum, which is why our eyes evolved to see at the frequencies they do. Second is, coincidentally, that very same 1 to 10 GHz gap. So, if you’re an intelligent alien, and you want to attract the attention of another intelligent alien, you’re going to try to do it on a frequency which, for one, is likely to be heard; and for another, is likely to be easily identifiable as artificial. So you’re probably going to want to send your signal on a frequency that makes it through an atmosphere, and where there’s a minimum of competing background noise, and — for extra measure — is right near the most universally recognized frequency of all: that of hydrogen, the universe’s most abundant element. Astronomers call this frequency band the waterhole, for two very good reasons. First, hydrogen and hydroxyl are the disassociation products of water, the best environment for life. Second, these signposts are universal, and would be recognized by any civilization anywhere; and so, like the watercooler at the office that draws a crowd, the waterhole is nature’s gathering point on the radio spectrum, a blatantly obvious place for interstellar communities to meet and greet. The Wow! signal was squarely in the middle of the waterhole, at 1.42 GHz. It was the perfect storm of intelligent interstellar radio signals. If we ever do receive a deliberate alien transmission, Wow! was exactly what we’d hope and expect to find. 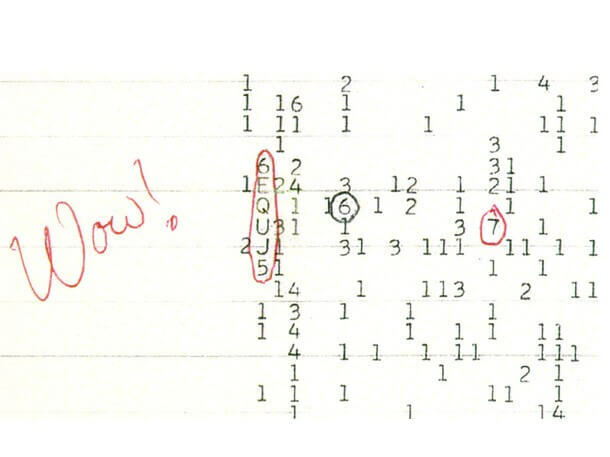 A radio transmission from a point in space in the direction of Sagittarius still remains the best technical explanation for Wow! Jerry Ehman, the astronomer who found the signal, has written that he chooses not to draw “vast conclusions from half-vast data”. In conclusion, yes, an alien intelligence is still a candidate explanation for the Wow! signal. But there’s no evidence for this. A stronger candidate is the significantly more vague explanation of an interstellar radio source of unknown origin. Meanwhile, Jerry Ehman’s famous scrap of printout with his famous handwriting rests in the archives of the Ohio Historical Society. In these days of manufactured mysteries and sensationalized nonsense, Wow! remains the genuine article: a true mystery, with potential implications unlike anything else in history. It’s quite possibly one of the most exciting unsolved mysteries that we have, and it lies quietly in the North American Astrophysical Observatory Records, with call number MSS 1151. Someday, someone will probably solve it. That’s a treasure hunt worth waiting for.